The Stampede Caravan Committee is the team of volunteers that puts on the famous Calgary Stampede breakfasts. These breakfasts have been part of the Calgary tradition for more than 85 years. The team get out early in the morning, rain or shine, to provide a Calgary welcome and a western pancake breakfast and entertainment. The best part, it’s free of charge to those who attend! That’s right folks, the countdown is on and we are one day out from Calgary’s biggest claim to fame and what many would argue is the best time of the year. 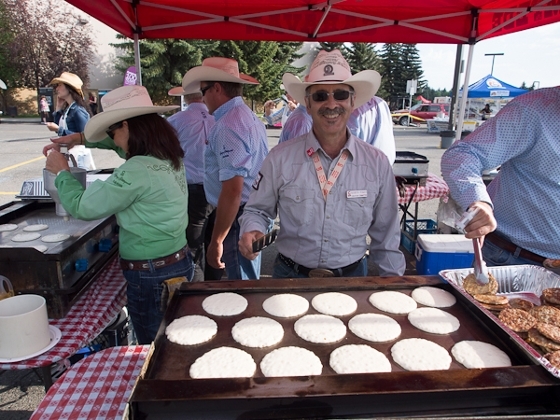 While some people dread the crowds and flannel that come with the season, there is one thing we think that everyone can agree on and it’s that food tastes better when its free, and pancakes are just better during Stampede! For all your free flapjack needs, we have put together a comprehensive list of all the big, small, fancy, informal, gluten free and gluten full breakfasts across the city. If you plan it right, you can score free breakfast (and maybe even lunch) for 10 days straight! Put on your stretchy jeans and treat yourself to one of these super delicious, super free Stampede Breakfasts around the city! * Don't miss this delicious competition during which several Mission restaurants go head to head to make the tastiest, most creative treats! There is something different every few steps! To find pancakes on the go, there is even an app called “Flapjack Finder” …so you never have to worry about missing out on your next free meal. Happy Stampede, everybody!